In a letter to the Journal of Investigative Dermatology, Georgetown University Medical Center's Michael Zasloff has shown that dolphins have remarkable recuperative powers — which may be of use to humans as well. Dolphins who suffer shark bites seem to feel very little pain, and they're resistant to infection and hemorrhaging. Plus when they heal, the contours of their bodies return almost to normal, even though other animals would have huge, malformed scars. Zasloff has proposed a number of different explanations for dolphins' healing powers. For example, when dolphins dive, they divert blood away from their extremities, which also stop them from bleeding out; and the dolphin's blubber may contain natural antibiotics and antimicrobials. 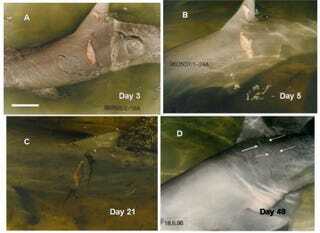 But what about dolphins' ability to heal major wounds while maintaining their contours? Zasloff likens this feat to regeneration, rather than healing, saying "the repair of a gaping wound to an appearance that is near normal requires the ability of the injured animal to knit newly formed tissues with the existing fabric of adipocytes, collagen and elastic fibers. The dolphin's healing is similar to how mammalian fetuses are able to heal in the womb." Unfortunately, the healing process of dolphins has been poorly studied, but hopefully we'll soon know more, and be able to apply some of what we learn to helping humans.